Fresh from Down Under, an Aussie brings about the essence of travel destinations in a jar. Almira Armstrong, Founder and CEO of Lumira; new to the collection, Tonic of Gin candle. “I don’t normally look at other candles for scent ideas,” Almira Armstrong shares bashfully. “They are mostly inspired by my travels.” The Sydney-based designer and entrepreneur has been around. Having earned a master’s degree in marketing, she opted to apply her skills to public relations in the fashion industry, which then led her to become the general manager of the local Sunstudios. From there: a long trek to London, and then another to Los Angeles, before finally settling in New York, where she worked at forever-cool Milk Studios. In the midst of witnessing the hustle and bustle in the world of creativity, Armstrong always delved into her creations, candles. “I used to make them at home, blending the wax and oils. It was a hobby that gave me comfort,” she explains, recalling that ever since she was a child, her most robust sense was smell. Taking in her mother’s vanity full of perfumes, she was inspired to try blending for fun, which, of course, came to a halt very quickly once her mother noticed. Travel candles and Perfume Oils. As we all know, smells can trigger memories and transport us to moments that may have been sitting dormant in the back library of our minds. To conjure up emotions—the thrill of that ride back to a special place, in a flash—Armstrong always appreciated the power of sense memory. Fast-forward, and she meets her the man of her dreams, another Aussie who happens to be working in New York. After falling in love, they decided to go back to their roots to start a family. However, the need to create kept creeping up, and it was her husband, Luke, who noticed how much she loved making candles and how happy it made her. Then, with Luke’s unequivocal encouragement and Almira’s dedication to her passion, Lumira (a combination of their names) was born. The year Armstrong forged ahead was 2010. Entirely self-funded and borrowing from credit cards, she started working with a Sydney-based perfumer, and then the blending experiments began, creating memorable scents from her many travel destinations, from Bali to Tuscany. “Fragrance can evoke a person, a place, and a moment in an enveloping and comprehensive way, providing an opportunity to return to it tangibly. No other sense is both as powerful and subliminal all at once,” Armstrong. Then, with much pride and hope, Atelier Lumira finally launched in 2013, with candles made from the highest grades of perfume oils and soy wax and wicked to perfection. In keeping with her entrepreneurial spirit, she went about it grass-roots-style, knocking on shop doors one at a time. Her venture paid off, the credit card bills and all, but, more importantly, it validated her belief that she has something special. Just out this month, the products are housed in new beautiful glass vessels and have very alluring scents. First up, Tonic of Gin, with notes of Murraya, chamomile, and juniper. It’s so good and subtle that even naysayers of all perfumed candles may have a change of heart. Then there’s Nuit de Noel, with notes of cinnamon, sage, and sandalwood, which will undoubtedly bring about holiday cheer. 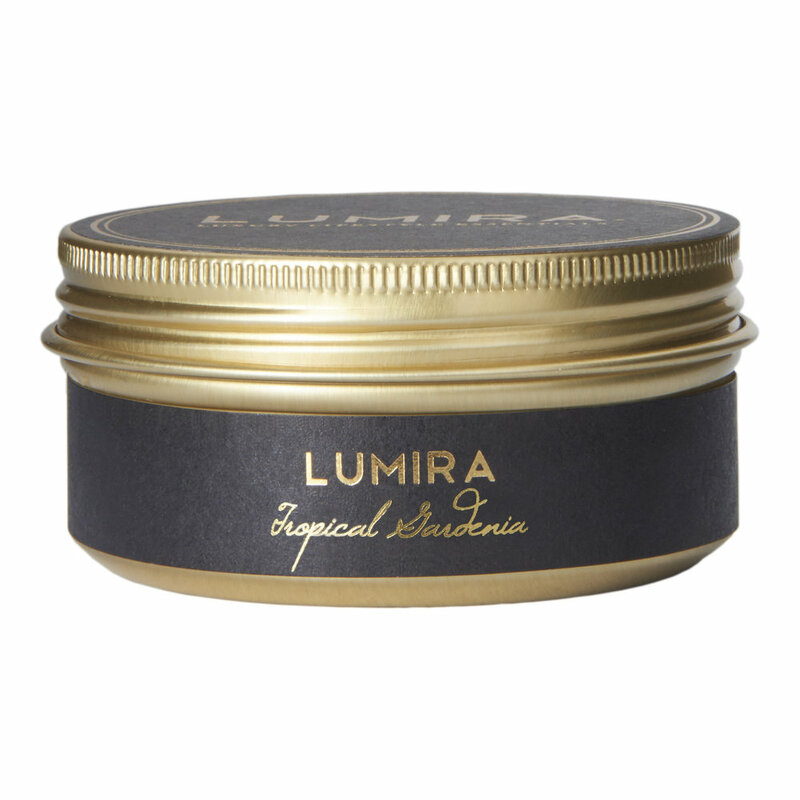 The Atelier Lumira collection also offers handsome, travel-friendly candles with wide-mouth screw tops, so the scents can span the globe! Also, let us not forget about her exquisite perfume oils. Fans will fall in love with not just one scent but, most likely, with all of them. Just in time for holiday shopping, look for them at Barneys New York and C.O. Bigelow, in New York, and at Selfridges, in London. 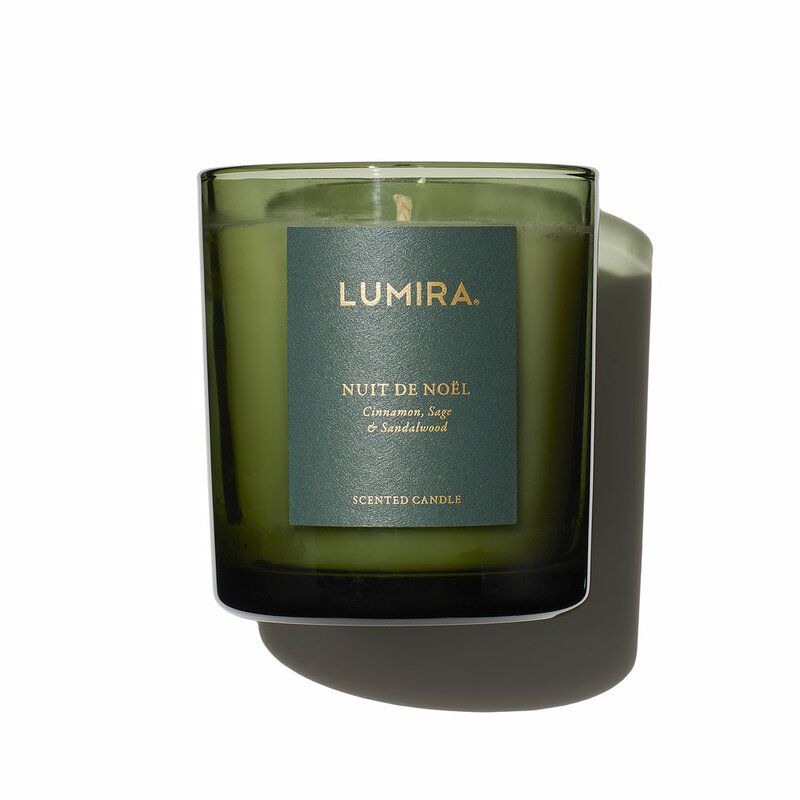 New Nuit de Noel candle.